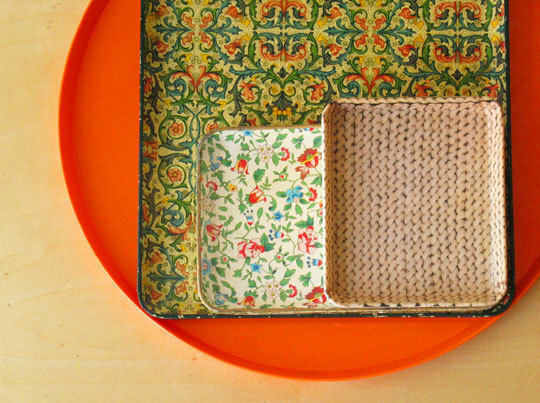 I got the idea to collect trays when I was at a hotel with my mom about 10 years ago. We were exhausted so she ran down to get breakfast and brought it up to the room. After looking at the typical cafeteria tray, my mom suggested I find a colorful tray and turn it into an end table. I loved the idea, and after spending the rest of the day at garage sales in northern Wisconsin, I actually found a 50’s style tray in a vibrant teal color. I still haven’t made that end table, but I did collect a few more options and use them throughout my house. There are endless possibilities – hang them on your wall as art, use them on a coffee table, put your jewelry on them, or create a mail drop near your door for your keys and mail. I saw this picture today and am inspired again. Maybe this time I’ll actually make that end table.